And it’s not surprising people are spending a higher proportion of their income on essentials. Median hourly earnings increased by 1.9% in the year to June 2011. This is the smallest percentage annual increase since the June 2000. All you need is a six figure salary. And according to SEEK New Zealand, you can get one because there is a 30% annual increase in job postings with a salaries of NZ$100,000 or more. They even have a special spot on their website. It helps to be an expert in IT, technology, engineering, accounting, sales and health care, and preferably live in Auckland or Canterbury. Being too greedy just got seriously not ok. It’s not just protests in Wall Street. The Economist magazine is not known for its socially inclusive thinking. 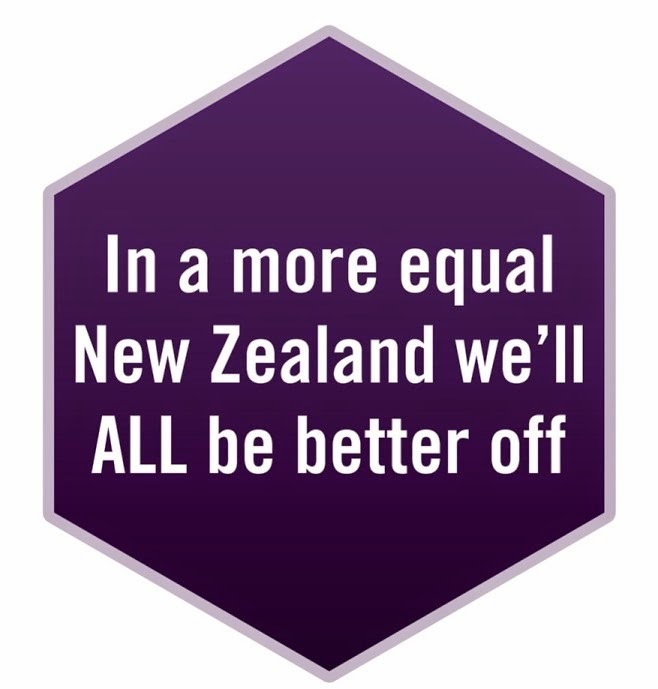 But, according to By Susan Guthrie and Gareth Morgan The Economist magazine is suggesting richer people pay more tax. This would have to be in the ‘extraordinary’ department. Greater expectations of beneficiaries to find jobs mean a greater need for out of school care (OSCAR) for children aged 5-13. So $2.8 million is going to OSCAR, and “red tape for providers is being halved”. We hope this will not mean any reduction in quality with changes including “reducing the number of standards from 11 to 6; trusting providers more and monitoring compliance less; making it easier for new providers to establish; and, enabling home based-care”. DPB recipients whose youngest child is 6 years or older are required to look for part-time work (at least 15 hours per week). 2. Inquiry into the determinants of wellbeing for Maori children - Find terms of reference here. Closing date to be determined. October 20 has been listed as the closing date on the Parliament website, but this is in fact a default date as it is the last day of Parliament. It is not the closing date for submissions. In a further development, Shine and Family Works Northern are working together to ‘offer a continuum of services from crisis intervention to medium-term follow up with families’. Services offered by two organisations will include crisis advocacy, social work, counseling and educative programmes for children, women and men. Their intention is “measureable change in the wellbeing and safety of families/whānau experiencing domestic abuse”. They intend to “continually research, develop and provide comprehensive information on trends and outcomes,” using a results based accountability approach. Te Matapihi cites a successful collaborative example of Maori housing initiatives. They are pleased the Office of the Auditor General (OAG) is highlighting positive Māori housing developments in the Western Bay of Plenty which are largely a result of good collaboration. The Audit report highlights how a group formed in 2009 has made a huge difference by bringing Te Puni Kokiri (TPK), the Maori Land Court, Western Bay of Plenty District Council, Tauranga District Council, Bay of Plenty Regional Council and Housing New Zealand around the table with Maori land trusts and their Maori Housing Forum. Local Maori land trusts have completed papakainga housing projects via the Horaparaikete Trust. Government needs to ensure all children grow up in healthy, nurturing and safe environments, and not target just some, according to Public Health Association National Executive Officer Gay Keating. If we single out families, we make things worse by dividing the country into ‘haves’ and ‘have- nots’. Gay says ensuring the wellbeing of all our children pays back huge dividends - both socially and in savings to the tax payer. New Zealand is at the top of the international league tables for - high rates of unintended teen pregnancy, death from injuries, and child abuse. Recent improvements in immunisation rates show that we can do better when we want to. "What works is when services are universal for everyone, and where extra support is provided wherever there is extra need." It’s not just Gay Keating. Recent visiting international expert, Michael Marmot says the same thing with an approach called proportionate universalism. Government is trying to improve outcomes for young people (12-18) by Social Development, Justice, Education and Health, and Police working together. Trials began Kawerau, Tokoroa, Te Kuiti, Taumarunui, Levin and Gore in March 2011 and will run for two years. They are focusing on reducing truancy rates, offending, alcohol and other drug abuse, and increasing the number of young people in education, training and employment. More. In a separate programme, Work and Income has youth focused seminars. Paula Bennett, Minister of Social Development and Employment says the young people need to get better at turning up. She gives the example of 899 young people in Northland (relatively high unemployment) booked for 66 seminars. 62% turned up and 314 got in work or training. 340 did not turn up. This suggests, of the 557 who turned up, 243 did not get into any work or training. Nga Tini Whetu: Navigating Māori Futures by Mason Durie has just been launched at Te Aute College. Mason is a Te Aute College old boy, writes great books, and is a phenomenal font of knowledge. The book combines 25 written and presented papers from Mason’s 2004-10 work and ‘explores the complexities of balancing Māori perspective with western knowledge, with a strong emphasis on achieving the best outcomes for Māori people.” All royalties will go to Te Aute College. Rates of rheumatic fever and other respiratory problems have forced more attention on housing quality. In Porirua, Capital and Coast DHB is working with Sustainability Trust to insulate cold, low income homes. Living in a cold damp house results in asthma, persistent colds and coughs, breathing problems, depression and skin conditions. Children and the elderly suffer the most. If you live in Porirua, and you or anyone you know needs assistance here, contact Sustainability Trust or talk to your GP. A special focus on warmer homes for Pasifka people is also being undertaken in Wellington and Dunedin. Government is contributing 60% of the insulation cost for households with Community Service Card (CSC) holders and 33 % for others. Householders contribute 10% and the Pacific Peoples Healthier Homes project provide the rest. The Department of Building and Housing estimates the housing shortfall in the Auckland region to be 90,575 dwellings in the 20 years to 2031. Hamilton City Council is thinking about selling all or part of its Housing for Older Persons portfolio. The plan is to save $14.5 million because of the city’s debt. They would like to sell most of it to a “significant social housing provider” and approach Housing New Zealand in the first instance. The public can formally have their early next year when the draft 10-Year Plan is open for public consultation. In the Hutt Valley, twenty-nine homes have been removed in Pomare and sixty-one are yet to go. Regional Public Health is warning of evidence “linking housing loss to a range of health problems, including stress, feelings of loss, grieving, and poor mental health.” The report calls for extra support to be given to people removed from Pomare. Murray has been heading Barnardos, and is a champion of the Green Paper on Vulnerable Children. He takes up the appointment next year. Family and Community Services is part of the Ministry of Social Development, spends around $138 million and contracts for over 1000 community organisations. The Government has committed $27.5m to help Crown funded employers in the health and disability sector to settle valid back wage claims. It has also committed up to $90m over three years to support employers phase in the minimum wage for employees who work sleepovers. Quality and Safety Challenge 2012 by the Health Quality & Safety Commission. - a fund for projects related to quality improvement, patient safety or consumer engagement. Applications sought from across the health sector including the NGO sector. More. What’s In Our Backyard? A Celebration of Community Research: Free Session. Includes: youth anger, strengthening families through schools and workplaces, Strengths of Bryndwr, Right Service Right Time, older people and home support services, Nicola Atwool (Families Commission). St Albans Uniting Parish, Cnr Nancy Ave & Knowles St, 28 October 2011, 10am-12.30pm, includes light lunch. R.S.V.P. to Rosalie Lau (03) 363 8201, or email rosaliel@psusi.org.nz by 20.10.11. Social Enterprise Journey: balancing social mission with making money: 15 November (Public Health, Newtown Wellington) and 22 (Mercy Spirituality Centre, Epsom, Auckland): Price: $195 for not-for-profit organisations, $395 for public sector. Includes GST, lunch and tea. Information sheet here, booking form here . Election Meeting for the Disability Community - To get disability onto the political agenda. Monday 31 October 2011, 1.30pm to 4pm, Western Springs Garden Hall, 956 Great North Road. Register by Thursday 20 October 2011. There is FREE , but please book. Find out more here Send registration form to Lisa at Parent & Family Resource Centre by fax 09 636 0354, telephone 09 636 0351 or email pfrcadmin@pfrc.org.nz. ACC Futures Coalition Election Breakfast on ACC: 4 November 2011 at 7.15am, Loaves and Fishes, St. Paul’s Cathedral Hill St. Thorndon; (speakers start at 7.30am), Cost: $10 (at the door), More, To register here and click on the rsvp link at the bottom.